Does the bell tower feel inaccessible? Ever wish you heard a more diverse range of music on such a powerful instrument? Well then come enjoy some country music played on the carillon and learn about the working-class origins of bell-ringing at U-M! 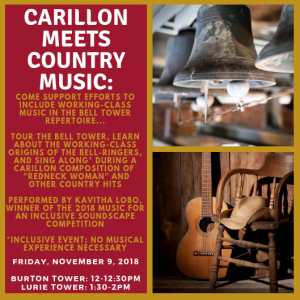 Carillon students will present a country music concert, followed by a tour of the belfry and a brief history of how U-M's original bell-ringers were from the working class. 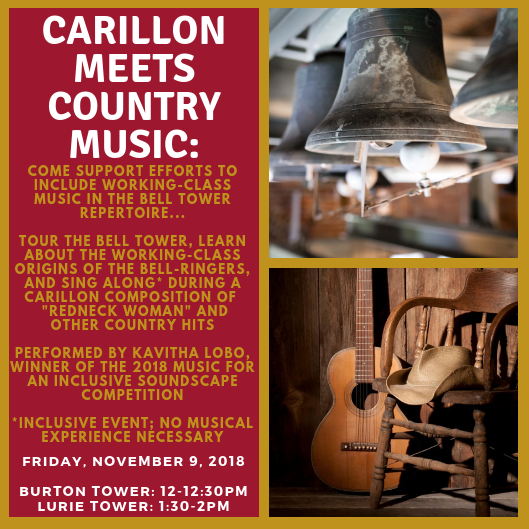 This concert is organized by Kavitha Lobo, one of the winners of the "Carillon Music for an Inclusive Soundscape" contest, and you will get to hear country pieces including: "Country Roads", "Simple", "Ring of Fire", and "Redneck Woman".